A major factor in gem pricing, colour value can vary between different types of gems. For example, colour has a greater effect on the value of blue sapphires than on blue topaz or yellow sapphire. As a rule of thumb, the more saturated the colour the higher its value. Personal preference is definitely a factor, as one grade of stone might be more appealing than another. In general, if there is more gray, black or brown in a stone, the price may be lower, unless, of course it’s supposed to be that colour. Red opals are the rarest opal colour, so they would be more highly valued. 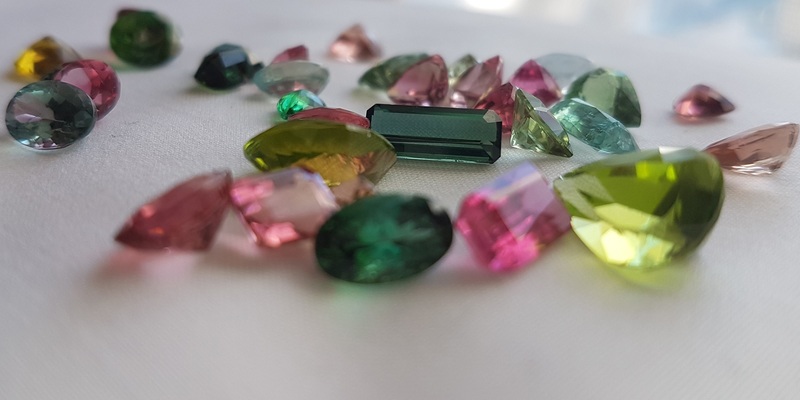 Even lower priced lightly coloured gems can be very beautiful if well cut. A stone that is relatively free of flaws, inclusions and blemishes will be more valuable than one that has flaws. The smaller and less noticeable the flaws, the more the gemstone would be valued. Diamond values rely more on clarity than those of gemstones, since the visual appearance and colour of gemstones have more bearing on value than the clarity of the stone. Clear stones, which allow light to pass through them, will have higher value if they are more transparent. Rubies and sapphires have microscopic particles within the stone which disperse the colour, so they may be expected to be less transparent, and can be more valuable than more transparent ones. The value of emeralds, rubies, sapphires, opals, jade, star and cat’s eye gems rely a great deal upon their transparency. Shape and cutting style aren’t as important as colour, clarity and transparency in determining the value of a gemstone, but shape, cutting style and the quality of the cut play a major role. Fashion and demand can affect prices, round over oval, for example. Personal preference is an important factor as well. The way a stone is cut or faceted can affect its price. Cabochon stones, which have rounded tops and no facets, are generally priced lower than faceted stones. 6. Cut Quality: The proportions and finish of a cut stone affect the brilliance and colour of gemstones, so this is a crucial factor to consider. A well-cut stone will have even colour throughout, with no dark or pale areas in the face, or flat area, of the stone. Coloured gemstones with good colour and brilliance may be cut deeper than diamonds. Stones with the same size face may be of different carat weights, which will affect the price. Carat weight refers to the size of the stone. Usually the higher carat weight, the greater the price of the gemstone. A carat is 1/5 of a gram. Some opaque or translucent stones, such as jade and malachite, are sold by the piece or the size of the stone rather than carat weight. Some cuts may be priced per piece, and some coloured stones under 1/2 carat can be priced according to size. If you’re going to invest in a gemstone, be aware of treatments. Has the stone undergone a process to improve its natural appearance? Most coloured stones are treated since high quality untreated stones are more rare and expensive. Some treatments such as dyeing or cavity filling are less acceptable than heat treatment. Almost all emeralds have tiny fractures, so it’s customary to fill them with oil, epoxy or wax. It’s important to find out whether a stone has been treated, to what extent, and what kind of treatment it received.